I am a fan of easy, healthy and quick when it comes to food (I’m also a fan of greasy, delicous and cheap but that’s a whole other blog post!). I am often overwhelmingly busy and just don’t have time to spend hours cooking each week. I thought I’d share my favorite easy breakfast, lunch and dinner with you. Overnight oats: throw oats, bit of brown sugar and almond milk in your container. The next morning add fresh strawberries and enjoy! This one’s easy (and not photographed). PB&J with a side of homemade popcorn. 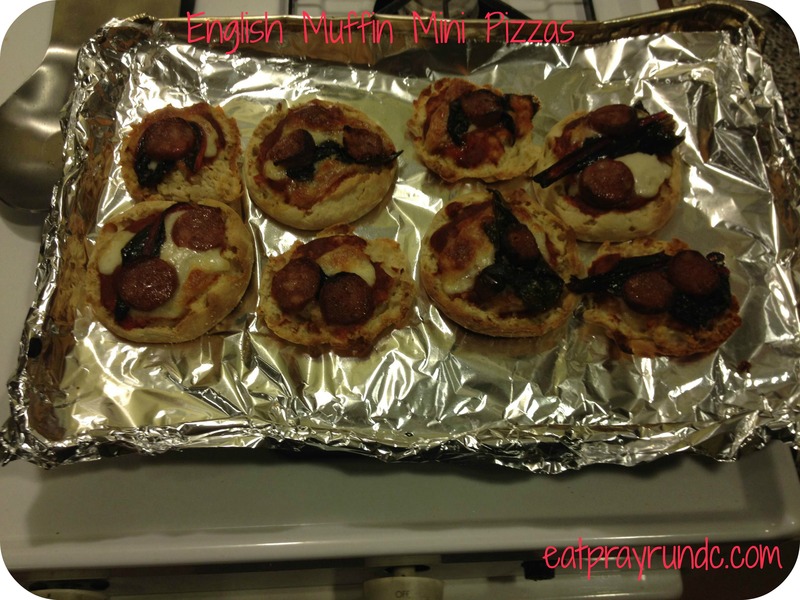 Easy breezy english muffin mini pizzas! (Recipe here). What are your go-to meals for a busy workday? 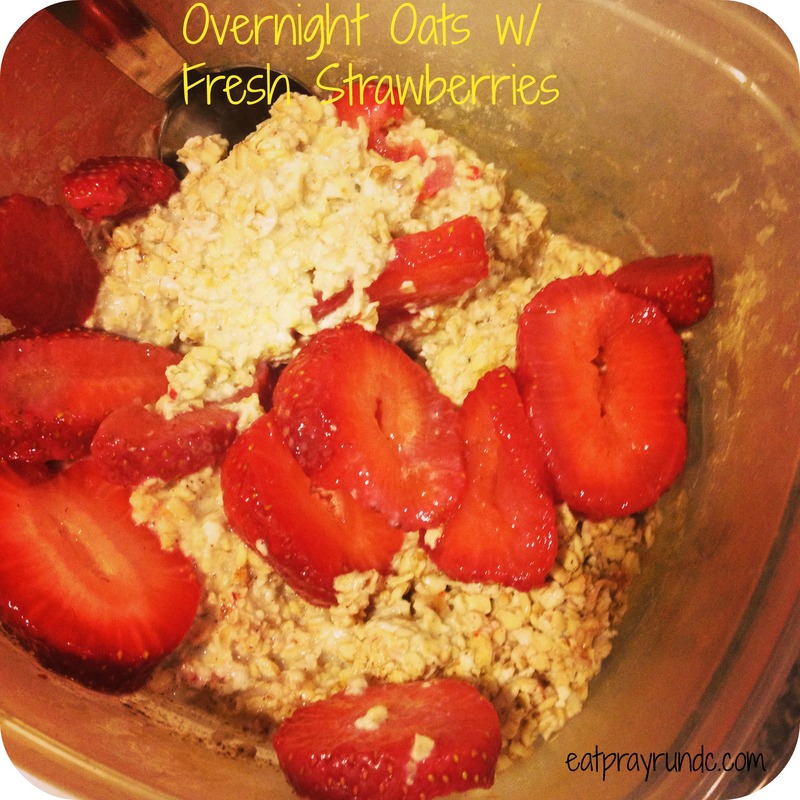 I have heard so much about these overnight oats! My favorite is still PB and J. Have you ever tried a grilled PB and J? It’s yummy! I have never tried that but it sounds delightful! I’m a big fan of overnight oats! I add some greek yogurt to mine as well as the almond milk. This is the recipe I use http://www.theyummylife.com/Refrigerator_Oatmeal. And the english muffin pizzas look delicious, I’m going to go check that link out. I think you’ll really like the english muffin pizzas – so good and you can just put whatever you have on hand for toppings. My quick go to meal is penne pasta with chicken. I toss it with pesto, sun dried tomatoes and feta. Yum! Yum! Pasta is a great go to quick meal! I’m not going to lie – I may or may not have had a PB&J sandwich for dinner last night, not ashamed. Mar @ Mar on the Run! recently posted…What’s in a Link Up? Love that breakfast idea – also looks like something my kids could get into. So glad you mentioned PB&J. its my secret weapon to fight hunger. Great share! I’m a huge fan of quick and easy meals too! All your meals look delicious. Christina recently posted…Saying Goodbye to Old Toys. It all depends on how much milk you add. I like mine on the thicker side so I add just a bit of milk (you can always add more milk in the morning) and they are perfect! Wait, what? You can do that to oats?? I have oatmeal probably 6 out of 7 days of the week for breakfast. This is awesomeeeeee! I love almond milk and strawberries, too! So, just throw it all together and put it in the fridge and the next morning, add berries and it’s done?